Moreover the definitions can be appraised by all registered users after the end of the contest. 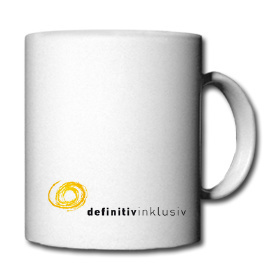 For the duration of one year, each month the definition with the best appraisal (at leat 10 votes) wins a t-shirt or a mug with the "Definition of the Month" in all contest languages. 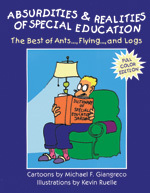 A Best-of-collection of 100 Cartoons out of former books by Michael F. Giangreco and Kevin Ruelle. A big Thank-You to Michael F. Giangreco and Corwin Press for the donated books. Published and donated by: Mensch zuerst – Netzwerk People First Deutschland e.V., Kassel 2008. 251 pages, numerous illustrations, incl. picture-CD. ISBN: 978-3-937945-08-8. A book for all those who want to know how to write texts in plain German . 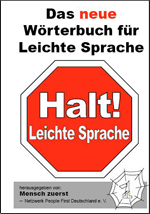 The book explains 400 words and provides further helpful information about "Plain Language" in German. The organizers reserve the right to raise the number of prizes. Present and former students and Staff members of Institute for Rehabilitation at the Humboldt-Universität zu Berlin are not allowed to take part in the raffle, but are of course welcome to submit entries for the categories "largest numbers of definitions", "most definitions from different countries", "oldest definition" and "definition of the month". The deadline can be extended by the organizers of the project.